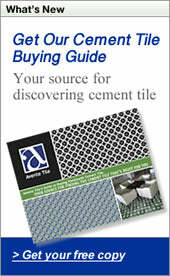 Avente Tile celebrates Bathroom Blogfest 2010 with two posts this week. Today's post is from me, Bill Buyok. Our guest contributor and Tile Maven, Sunny McLean, will post later this week. Avente Tile is excited and honored to participate in this fun and perfectly planned blogfest orchestrated by Christine Whittemore of Simple Marketing Now LLC. "Stuck in the 60s?" is the theme of this year's Bathroom Blogfest. It is inspired by the TV shows, Mad Men, that, according to Christine, captured our imaginations for its portrayal of life in the 60s when social and cultural taboos meant that many critical aspects of life – like bathrooms – were ignored, glossed over and treated dreadfully." Interestingly, I found out yesterday that Christine doesn't watch TV and only attempted to watch an episode as homework for this assignment. That makes her OK in my book, because I'm in the same boat. So missing the Mad Men tie-in, let's see if bathroom design is stuck in the 60s and what critical aspects are missing. When I think of the 60s an image appears in my head similar to the one above. Let's face it. Nobody wants to be stuck there. Also, I think of pale peach bath tiles, white Formica with marble swirls and gold flakes, avocado green refrigerators, brown and gold mirrored wallpaper, and cheap cabinets made out of particle board with a badly-done faux wood grain plastic finish. My description is filled with negative connotations and implies there was certainly some lackluster design. Did the designers of those days gloss over the details and make a mess of it? Are these more contemporary bathrooms that much better? I say no. We forget that a 1960's bathroom was designed by and for someone living exactly at that time. It is easy to poke fun of something and find its flaws after 50 years have passed. Values and styles change and so do our needs. There's a generation gap, so to speak. We like the more contemporary bathrooms because we relate to them better. They are more familiar. In the 60s, the choice to use plastic (even for wood) was a 'hip idea', colored tubs and toilets where a thankful change after years of sanitary white, and bold statements with color were all about defining yourself as 'not part of the establishment'. Bathrooms were smaller and very utilitarian - folks didn't linger there. The concept of the urban spa didn't exist, so we didn't even know we could luxuriate in our home bath/spa. To help understand the 'generation gap' and how baths were viewed, take a look at the 1960 Kohler ad. The focus is on the housewife bathing her kids. A 1960's bath was darn nice if you were of course living in it during the 1960's. We are not stuck in the 60s. Here's some examples of how things have changed. Everyone is better at defining needs at the beginning of the project. People are better at understanding that what I want isn't going to be the same as what you want. Thank God, we don't all have to have the same peach-colored bath tiles. Our recent post, Discover Your Dream Bath, is a great tool for defining your bath goals. There is a definite appreciation for customization. People want to express themselves through their home and use a large mosaic or decorative tile mural for a tub backsplash. Homes are built and remodeled with more bathrooms to accommodate kids, pets or guests. Bathrooms are larger and include storage, adequate space for personal items and guest towels, and plenty of hooks for towels and robes. Niches create space and add convenience for beauty products in the tub. Most folks (even in these tight times) include an allowance and incorporate some mini-home-spa features: an artisan tile backsplash, brushed nickel robe hooks or a spa tub. Finally, try to use more natural light, larger windows, and good ventilation. See, a lot has changed since the 60s. Now you can sit back and relax. Fix yourself an extra dry martini - shaken, not stirred! Bill, you are unbelievable! I can't believe that you found these 'stuck in the 60s' images [BTW, they remind me intensely of my childhood - we had an avocado green/orange kitchen AND the pink tile bathroom...]. I'm delighted to find a fellow no-time-for-TV kindred spirit and love the observations you make about appreciating the 60s experience with a 60s mindset. Welcome to the Bathroom Blogfest! You are a wonderful addition to the BBC community. We had the lovely avocado washer and dryer. Somehow I've blocked the bathroom colors from my mind, but I do remember the alternating black and white linoleum (I think) tiles. I just know we had 4 sisters sharing a 2-sink bathroom and no-one seemed to ever put in clean towels! There was no lovely style to reminisce lovingly about! And my mom lost interest in housework and related chores as soon as we were born, so I don't recall her bathing us, pink/peach walls or no! Christine, thanks for your supportive words. And, I swear the photos come from my family album - I can't believe how ubiquitous these styles were. Glad to be a part of Bathroom Blogfest 2010. Alexandra, blocking out things from your childhood may be good in the short term; but, there may be long-term effects. The fact that you are still talking to your sisters is a testament in itself. What doesn't kill us, makes us strong! Stuck in the 60's? Not in this Bathroom!